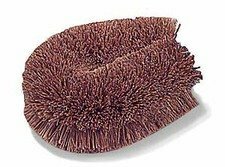 Plant anti-scratch double sponge with delicate side in 100% natural cellulose to efficiently clean dishes as well as bathroom and kitchen surfaces, and rougher natural sisal plant fibre side to scrub the toughest dirt from pots - including non-stick. 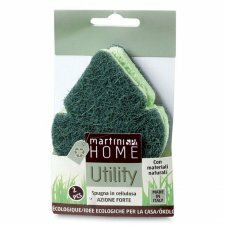 The Martini Spa Home M Green anti-scratch plant double sponge takes its components from nature. The delicate side in pure 100% natural cellulose efficiently cleans dishes as well as bathroom and kitchen surfaces, while the rougher anti-scratch plant fibre side, made from natural sisal, scrubs the toughest dirt from pots (including non-stick) without damaging them.Directions for use: rinse before and after each use. Machine wash up to 60°. Do not use the fibre part on non-stick and delicate surfaces. Plant double sponge with delicate side in 100% natural cellulose to efficiently clean dishes as well as bathroom and kitchen surfaces, and rougher natural sisal plant fibre side to scrub the toughest dirt from pots. 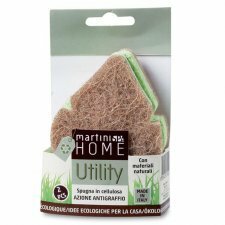 The Martini Spa Home M Green plant double sponge takes its components from nature. The delicate side in pure 100% natural cellulose efficiently cleans dishes as well as bathroom and kitchen surfaces, while the rougher anti-scratch plant fibre side, made from natural sisal, scrubs the toughest dirt from pots. Directions for use: rinse before and after each use. Machine wash up to 60°. Do not use the fibre part on non-stick and delicate surfaces. 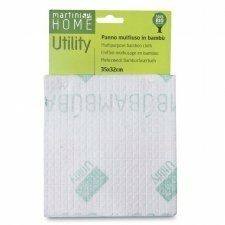 The Utility multipurpose cloth made of bamboo is highly absorbent and fast-drying. It prevents the development of unpleasant smells thanks to the anti-bacterial properties of the bamboo fiber. The use of natural fibers and the special printing with low-fixing ink made the bamboo Utility cloth eco-friendly and 100% biodegradable. These daily aids for 100% clean surfaces combine innovative recycling technology with the utmost functionality: for the absorbent side, 100% post-consumer foam from old sofas and furniture is reused. The gentle scouring side for sensitive surfaces is made from recycled PET bottles. Ergonomically shaped. Packaging: 97 recycled cardboard. 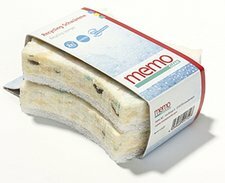 These daily aids for 100% clean surfaces combine innovative recycling technology with the utmost functionality: for the absorbent side, 100% post-consumer foam from old sofas and furniture is reused. The extra-strong scouring side is made from recycled PET bottles. Ergonomically shaped. Packaging: 97 recycled cardboard. A pure natural product made ​​of coconut fiber and stainless steel cleaning brush wire. Almost indestructible, heat resistant and with very dense fibers (no plastic brush has such dense stocking levels). Useful in the economy as a kitchen fruit and vegetable brush, pots, ovens and countertops, for coarse cleaning in the industry, for cleaning skin (nail brush), etc. 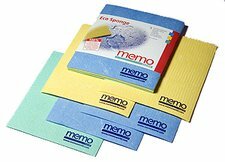 We use only natural raw materials such as cellulose, cotton fibre and sodium sulphate to make memo sponge cloths. 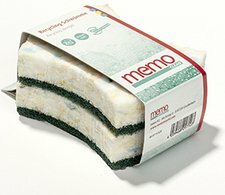 They are highly absorbent, durable and scrub-resistant, lint-free, pleasantly soft and washing machine-safe (boil-wash). Simply dispose of used cloths in the household waste (100% biodegradable according to EMPA-Test).